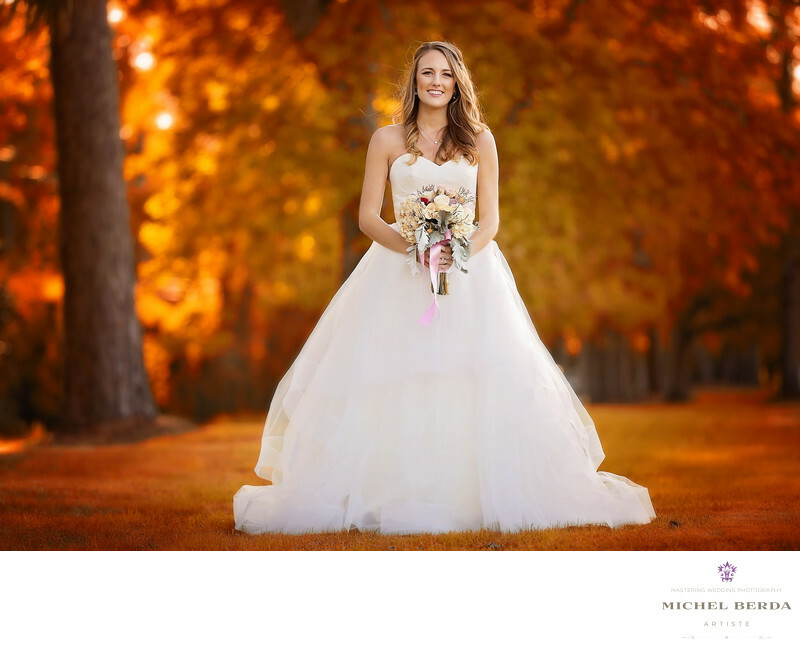 Anytime I am so honored to capture a bridal portrait, I aim high to produce an amazing and compelling image. For this bridal portrait that I captured at Boone Hall Plantations & Gardens, I realized that the bride was not only beautiful but wearing a bridal gown, made by a very famous designer, Mrs. Hayley Paige. As a wedding photographer, I know this designer very well and know that many brides love her design and the elegant wedding gowns she produces. I have to say I am a big fan because they have such a beautiful unique fashion style to them each bride has that unique glow to them by wearing individual wedding dresses designed by Mrs. Paige. How could I capture this image to make this a compelling bridal portrait image that reflected Boone Hall, Plantation & Gardens, with a southern low country appeal? First was capturing the image in perfect lighting. Next came my master editing that reflected a fall like look in our holy city of Charleston, SC. At this amazing plantation. I am thrilled with this final image. I know the result is exactly just that. The image is warm and rustic. Keywords: Boone hall wedding photographer (3), Charleston Wedding Photographer (24), Michel Berda (1140), photographer (1125), Wedding Photographer (1254), wedding photographer boone hall and gardens (3).